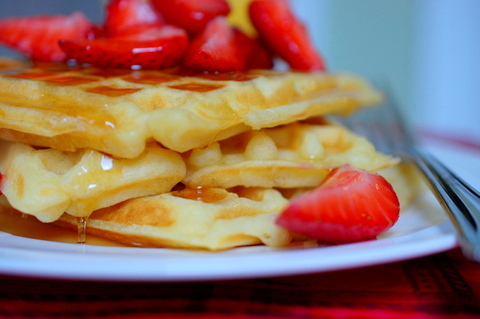 Have you ever “Googled” Homemade Waffles? Everything you ever wanted to know about homemade waffles, and at least a million, homemade waffle recipes can be found there. Between healthy-homemade, scratch, Belgian, buttermilk, buttery, delicious, blueberry, Grandma’s, Dad’s and Aunt Mae’s, it is entirely possible, that this may not be, the best homemade waffle recipe E-V-E-R. The only thing I know for sure, is that it’s my recipe. I took it from my 1979 Pillsbury Kitchen’s Family Cookbook, and I’ve used it ever since my boys were little and they would pitter, patter their way to the table in their bare little feet and pajamas. They rubbed their sleepy little eyes and we ate waffles until we were contentedly happy and full. And they were always good. I can’t help but think homemade waffles are nostalgic. I associate them with special occasions and late, lazy breakfasts. Making waffles from scratch, means I’m filling the air with flour, cracking open eggs and messing up my baking bowls. It means, I’m heating up my waffle iron, chopping fruit and getting my fingers sticky with maple syrup. Waffles from scratch, mean I want you to grow up healthy, and strong and happy and able to go wherever your heart takes you. Waffles from scratch, mean I love you. 1. Heat up the waffle iron. 2. Place egg yolks in a large bowl, and whites in a separate bowl. 3. Add buttermilk to the egg yolks and beat well. 4. Add flour, baking powder, soda and salt, beat until smooth. 6. Beat egg whites until soft peaks form; fold into the batter. 7. Bake in hot waffle iron until steaming stops and waffle is a golden brown. I always spray my waffle iron with Pam or brush it with melted butter before adding the batter. 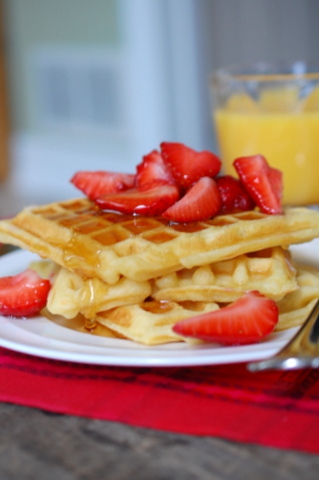 Be careful not to over-fill your waffle iron or the batter will spill over the edges. It’s a good idea not to stray to far from the waffle iron to avoid scorching. 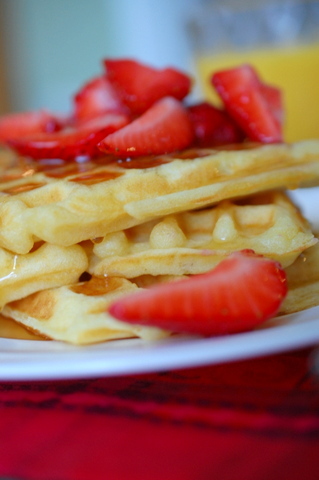 I always serve waffles with cut up fresh fruits like berries or banana’s for good nutrition.